What was Nancy Pelosi reading during President Trump’s State of the Union speech? Does it matter what she was reading? She was rude and wanted everyone to know she runs the country and no one else. She is a disgrace to her gender. It was downright rude for her to be flashing papers while the President was speaking. What a darn shame that she would be playing games when the nation is facing critical issues like immigration and the horrible national debt! Instead of continual attacks on President Trump, why can’t the Progressives do what is right for the country? PS:Thanks – I had to laugh at some of them. She was showing her contempt not only for President Trump but for the Republican Party and the Presidency. She and those like minded Democrats and Republicans are an embarrassment to the office they hold. Their commitment to obstructing the Administration gives no thought to us the citizens who want a functioning government by “We the People”. If it weren’t for the shadow of President Trump’s signature sometimes seen as she shuffled the papers, I would have thought that it was a draft for the next subpoena to be issued to a Republican, ANY Republican. They can’t wait to get started with their endless, fruitless investigations designed to muck up any progress the president is trying to achieve to make life better for every American. I thought the Speaker was very disrespectful of President Trump, VP Pence, the House members, and all attendees. Her hand signals to the women in white (SOTU, not SOTheDemocrats), distracting with the papers, not sitting down “on time”, and her weird practice of chewing her cud (I’m awful) were just plain rude. The dems are becoming caricatures of themselves. How can anyone take them seriously? She acted in a very self-centered and arrogant manner. I’m not sure she is mentally all there to be so openly rude in front of millions of viewers! How she is still Speaker of the House defies all logic — a huge disgrace! Her behavior was rude! She is not a leader who cares for America but one thst is pasionate only for HER agenda. It doesn’t Matter what she was shuffling through. What matters is that she was rude and disruptive. I have never seen that before. She is a shame and disgrace to Congress and America. I’m sure it was the copy of President Trump’s speech which he handed to Pelosi and the VP. At any rate it was another cheap shot at our President. All it served to do was further cheapen Pelosi’s character. Shameful! If the Senate leader of the Republicans, had showed so much lack of respect when Hussein Obama was rambling, they would’ve been crucified! But, Trump got his point across, and I feel her actions, were a waste of time. Pelosi ought to be sanctioned for showing such utter disregard and disrespect for the sitting President of the United States. For God’s sakes, Congress, punish that freak for her lack of propriety in open Chamber, the Justices and the Nation’s Legislators!!! She was on national television and she did that with malice aforethought, plain and simple. had pulled a stunt like this when Barry was POTUS. It doesn’t really matter other than she was confirming her lack of respect for the President…and the American people who elected him! !Her bad manners are only one reflection of an ignorant woman …lacking in decorum…and dignity. I know it was the presidents speech, but I had to mark reading her next vacation plans. Her only concern has nothing to do with any of the safety of our country or any concern for any American. In her world it’s all about her. How to remove peanut butter from the roof of her mouth. I’ve read that President Trump changed some of his speech from the original one. 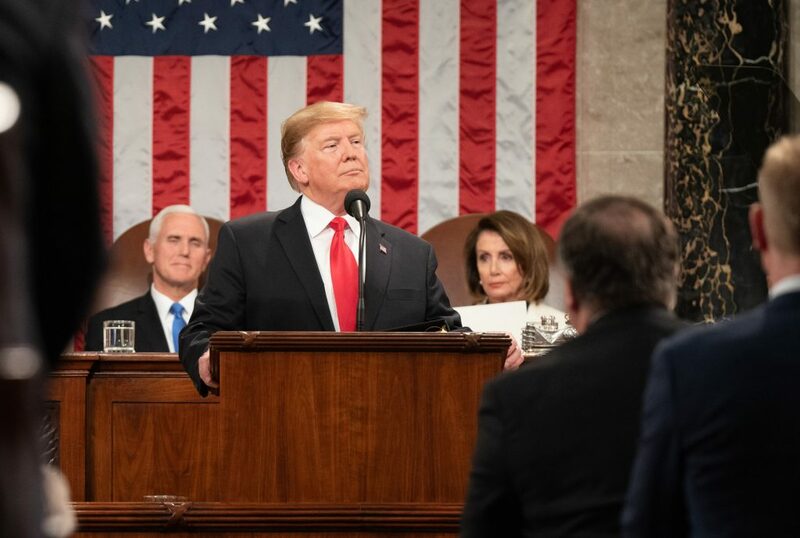 After he had the “women in white” stand up and cheer, which Pelosi didn’t like, she had to check her copy of the speech to see how she missed this part.